"It's been a crazy two years," Paul Rustchynsky tells us - and that's putting it mildly. In 2016, Rustchynsky was the game director for Driveclub - PlayStation's attempt at a long-tail racing game that would grow into one of those live services that are so lucrative today. 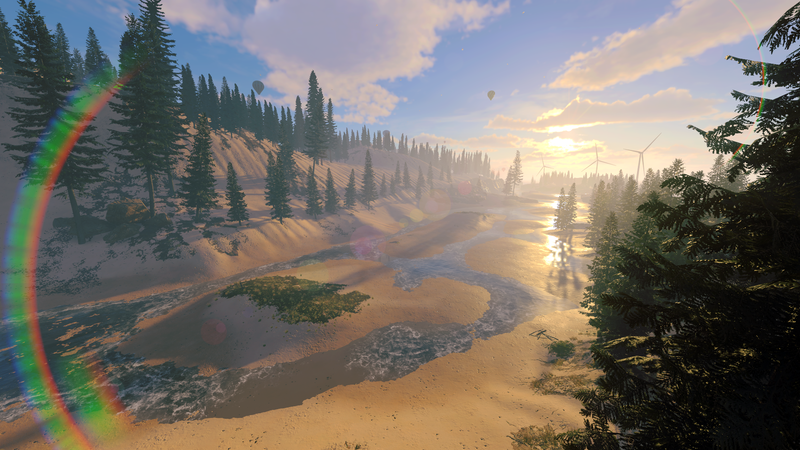 The project got off to a shaky start, but within a year Rustchynsky and his team at Evolution Studios had turned the game around, finally granting it the attention it deserved. Sadly, it wasn't enough. Sony announced the studio's closure in March 2016, lamenting the loss of "high calibre staff". One of the UK's longest-running and most notable studios was gone. "These guys are family. We've all worked together for ten-plus years, some nearly twenty. It's crazy how long we've worked with one another but that means we know how to get the best out of everyone"
Usually in this situation the talent on the team disperses, either taking jobs at other studios or collecting in smaller pockets to form their own. But just a few weeks later, Codemasters revealed it had picked up the majority of the Evolution team and brought them into the fold as Codemasters Evo. In fact, the day-to-day for the developers behind Driveclub, Motorstorm and WRC pretty much returned to normal. "We're even sat at the same desks," says art director Alex Perkins. Rustchynsky was delighted: "These guys are family. It really is a family. We've all worked together for 10-plus years, some nearly 20. It's crazy how long we've worked with one another but that means we know how to get the best out of everyone. "Codemasters are a fantastic company to work for because they share the same ambitions. They want to make the best racing games, so we've been able to share a lot of the same knowledge and all the information they have about players, which has been fantastic. They've been there since day one to support our vision." That vision is on shelves today in the form of Onrush, a racing game for PC, PlayStation 4 and Xbox One. It's also part of the reason Codemasters rescued the Evolution team. Rustchynsky recalls how he and his colleagues approached Codemasters with a "pretty crazy idea" for an "arcade-style AAA racer, but not a traditional racer." "We wanted to reinvent the genre a bit, bring in our influences from past arcade greats but also modern games like Rocket League and Overwatch - games that do multiplayer in a very different way to racing games," he explains. "They supported that from day one. They were like, 'That sounds great - now prove it works'." 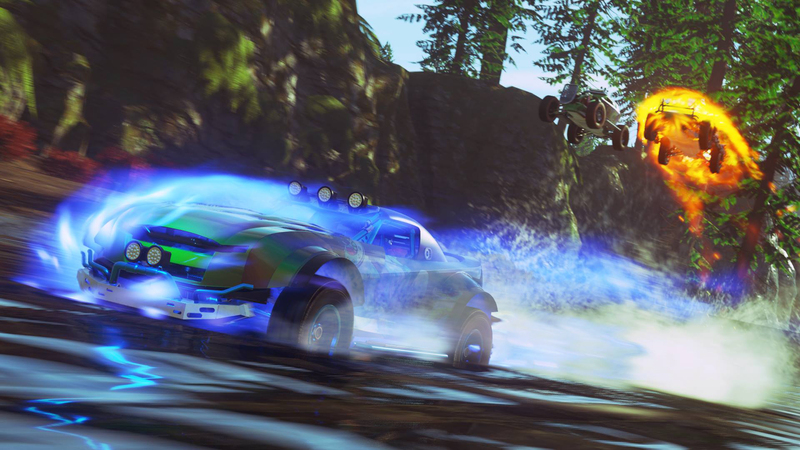 Onrush sees players racing around a variety of tracks, but none of the game modes are won by crossing the finish line first. Instead, racers are split into teams and must complete certain challenges to earn the most points. For example, one mode rewards boosts with points so the team that earns the most boosts, either by completing jumps or knocking other cars off the track, is victorious - regardless of where they are on the circuit. "We wanted people to be able to play together. Other genres do this really well, but racing games are all about that competition - if Rushy gets out in front, you won't see him again"
The concept stemmed from conversations among the team about which elements of racing frustrate people who aren't solely dedicated to the genre. As mentioned, they looked at what makes titles like Rocket League and Overwatch so successful, to the point where they attract an audience that goes beyond the typical fans of such gameplay. There was also a desire to balance the playing field. "We wanted people to be able to play together," says Jamie Brayshaw, assistant game director. "We've all got quite a wide range of racing ability: Rushy [Rustchynsky] is an absolute pro, me and Alex are a peg down from that. We wanted to create an experience the three of us could play together as a team, in co-op or online, and still support each other and enjoy ourselves. Other genres do this really well, but racing games are all about that competition - so if Rushy gets out in front, you won't see him again while we're trying not to finish last. "We wanted to do something completely different which gives you the opportunity to do something incredible even if you're not the best racing player." Given the team's extensive experience with racing games, this might seem a simple task but Perkins says it required Evo to "fundementally change our approach to a lot of things". "If I'm going to be cocky about it, I think we've overdelivered in the time that we've had, and given that we had to build the next version of Ego"
"The tracks are big and multi-routed, almost like a horizontal mountain where you pick your path rather than just following that perfect line around the tarmac," he says, by way of example. "We had to rethink everything." Brayshaw adds: "We took inspiration from how first-person shooters designed their maps to create theatres for takedowns. We gave players different lanes for taking down the 'fodder', the easier AI grunts that are in the mix alongside the players, but also giving you the opportunities to go wide to attack the track to earn more boosts or attack the pack by going high and dropping down to get those takedowns." It's unusual to hear of a racing game looking to a first-person shooter for inspiration, but it illustrates how determined Evo is to break beyond the limitations of its previous titles and create something new. As Brayshaw observes, Rocket League proved you can "have fun in cars without having to commit 10 minutes to trying to reach the finish line before everyone else." The challenge this presents, however, is satisfying both fans of Evolution's back catalogue and newcomers. As Rustchynsky mentioned, the genre is historically about competition, often at the expense of accessibility. The most obvious example of countering this is Mario Kart, whereby less-skilled players are given more powerful items to help even the score. Nintendo has tweaked this with every iteration, occasionally evoking the ire of long-running series fans as they find themselves 'blue-shelled' back to a lower position despite the lead they had justifiably gained. "We actively wanted to avoid the scenario where we punish the better players," Rustchynsky acknowledged. "We love Mario Kart but that is one of the most frustrating things about it. It was more about punishing player mistakes less. So people who get wrecked or fall behind a lot, rather than punishing them heavily we're getting them back into the action as quickly as possible. The people who are excelling still score huge amounts of points or do what they do to win that mode." 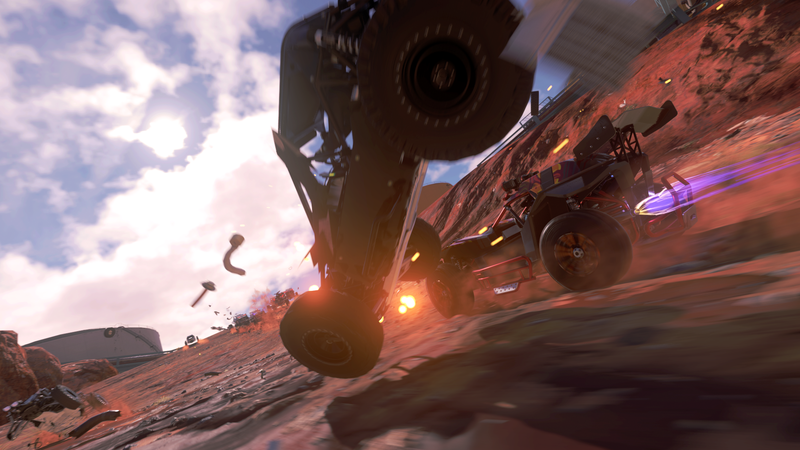 "Onrush is less of a rubber band and more of a catapult. The frustrating thing about rubber banding is you feel like you're being punished for playing well. We've definitely not done that"
Brayshaw adds: "Onrush is less of a rubber band and more of a catapult. The frustrating thing about rubber banding is you feel like you're being punished for being good and playing well, not being allowed to reach your potential. We've definitely not done that." There are still some systems to help lesser-skilled Onrush players get back into the thick of the action. More 'fodder' is spawned towards the back of the pack, these easy takedowns granting regular opportunities to earn boost. Equally, the developers stress, everything struggling players do that earns points add to their team's overall score. Say you only earn 10 points in a match, that could easily be the difference between victory and defeat. "You always feel like you're involved," says Brayshaw. "Anything can happen, and you can be the one that makes a difference." But this is not the end of the Onrush story. While the game is on shelves now, the Evo team is by no means starting on a fresh project. Instead, they hope to build the title over the years to come - much like the non-racing games they took inspiration from, and much like they attempted with Driveclub. Plans are already underway for new modes and content, and the studio is establishing a relationship with its growing community thanks to a beta test last month. For Brayshaw, this is part of the natural evolution of how games are developed today. "We'd been down that PlayStation trench for so long. Cross-platform development was a bit of a shock - some people had only ever worked at Evolution since the days that Sony had bought it"
"Players have come to expect more than what they get right out of the gate - especially for multiplayer games," he says. "[They expect] fresh things to play and much more things to come back to over a longer period of time. You don't just play it for a week and move on to the next new game like you used to." OnRush has been developed within the space of two years, which sounds fairly standard for AAA games today - but the circumstances in which the project began makes this accomplishment far more impressive. With the closure of Evolution Studios, the Evo team had lost all access and rights to the Ego engine that powered its previous games, nor did they have an IP they could use to gain attention. Fortunately the lessons learned from those past project, particularly Driveclub, put the developers in good stead. "We made plenty of mistakes," says Rustchynsky. "We're open about that. There were problems that we knew about, and we had to come up with different solutions because we knew we had a shorter period of time than we did when we built Driveclub, so we had to be much smarter about the way that we worked. We were very focused and we knew exactly how we were going to approach it compared to how we used to in the past. It allowed us to prototype and iterate early on - that was a key focus." There was also the added hurdle of developing for multiple platforms - a first for the team - but the support of Codemasters' established studios helped bring Evo up to speed, says Perkins. "We'd been down that PlayStation trench for so long," he recalls. "Suddenly, things were super wide, we were having to learn about Xbox. Obviously we could help [Codemasters] with some of the PlayStation 4 stuff, but cross-platform development was a bit of a shock for some of us. Some people had only ever worked at Evolution since the days that Sony had bought it." None of this could have been accomplished, however, were it not for the fact that around 90 per cent of the team was comprised of original Evolution developers. That shared experience is something Rustchynsky believes drove progress on Onrush and enabled them to achieve so much in just two years. "If I'm going to be cocky about it, I think we've overdelivered in the time that we've had, and given that we had to build the next version of Ego," he says. "It's been a really big challenge, and having to push the team to deliver the best possible game has been tough. "But because we've worked together for so long, we've overcome most of those challenges. We understand how to get the best out of one another, and I think we've delivered on everything that's been asked of us." Brayshaw agrees: "It allowed us to hit the ground running. New tech, new IP, new idea within two years - the only way that's possible is with a team that knows each other inside out." Having a great respect for Rustchynsky and team for their past work, very specially Driveclub, I still don't see the point of this game. I would really have loved them doing a spiritual succesor of Driveclub, but or On Rush has a communication problem, or maybe it's me, but I don't find it appealing. Whishing them the best luck. I, on the other hand, find the idea fantastic. in an age where there only seem to be simulators everywhere, to want to be more realistic than the other, something different is more than welcome. It's a brilliant idea, and I hope it's a well-rewarded bet.